Lancaster City boss Phil Brown is hoping his men will be on the ball next season – quite literally. The Dolly Blues manager is looking to incorporate a different style of play from the one which has served them well over the last few years. A high-energy, counter-attacking team, City have enjoyed much success playing that way, winning the NPL First Division North title in 2017 . They then went on to consolidate their spot in the Premier Division last season – albeit without setting the world alight. However, Brown believes now is the perfect time to evolve his team’s style of play. Instead of conceding the lion’s share of possession during games like they may have done in the past, Brown is keen to see his men keep the ball more – something which he thinks will serve his team better in the Premier Division. “I think the last couple of years, we decided to go down the route of teams like Leicester,” said Brown. “We had a team full of legs and energy and we looked to hit teams on the break. “It’s no secret that over the last few years , we have soaked up quite a bit of pressure without dominating the ball. “During the season when we won the Championship, we hit teams on the break and had a centre forward like Jordan Connerton up top to stick the chances away. “Last year, we were a little bit similar, but we did not really have someone like Connerton to stick the chances away, although our goals came from other areas of the team. 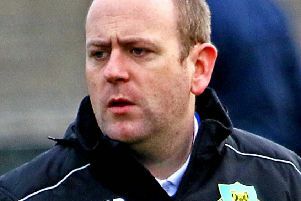 ”But I think having stepped up a level to the Premier Division, I don’t think you can afford to give teams the amount of time on the ball as we were allowing and ultimately we paid the price. “The players that we have brought in are all capable on the ball and experienced in different ways. “I am not saying we are not going to counter attack in the future – you only have to look at the World Cup to see that teams can have success playing that way. “But I want to see us keep hold of the ball more and have a bit more balance to our play. With pre-season training about to get underway this evening, Brown declared himself happy with the squad at his disposal. Although he has lost a few players – including the departures of club skipper Ricky Mercer this week and veteran full-back Rob Henry – Brown has been very active in the transfer market. Following the captures of Matty Blinkhorn, Craig Stanley, Charlie Russell and Rob Wilson, right, he swooped for midfielder Richie Baker this week. Brown has also managed to secure the services of the vast majority of his exisiting squad – including the signing of defender Steve Williams last week. “The squad is taking shape now,” Brown said. “I am more than happy with what I have got in my squad. “I’m really happy with the balance and quality.